The value of Alabama’s teacher salaries has been eroding for many years and is now worth less than it was a decade ago, an AL.com analysis shows. Amy Marlowe is the assistant chief of member advocacy and outreach for the Alabama Education Association. Marlowe said while teachers appreciate the small pay raise, she doesn’t think it will be enough for teachers who are suffering from not only low wages but also low morale after many years of bludgeoning from lawmakers and the public. Teachers in Arizona, Colorado, West Virginia, Oklahoma and Kentuckyhave protested austere education budgets in recent weeks, with some winning raises for themselves and others forcing Republican-led legislatures to support tax increases that will eventually lead to higher education funding. North Carolina teachers will demonstrate against low wages and education funding at the state’s capitol on May 16, the opening day of that state’s legislative session. Marrianne Hayward leads the 2,000-member Jefferson County chapter of the Alabama Federation of Teachers. She doesn’t mince words on the subject of teacher pay. “I think we’ve been desensitized to think ‘oh thank you so much for 2 percent’,” Hayward said. The raise was likely a preemptive move by lawmakers in an election year, she said, “but there is a strong undercurrent” among her members, that much more needs to be done to improve working conditions for teachers. “They’re going to reach the breaking point,” she said. Pat Miller is in his 33rd year of teaching in Huntsville City Schools. He’s taught at the middle school and high school levels and is teaching Advanced Placement Psychology this year at Grissom High School. He feels that lack of respect, too. Miller said he is thankful Huntsville’s school board recently enacted a three-year, $10 million plan to improve teacher pay in his district because of the loss of value of teachers’ wages since the Great Recession has been difficult to sustain. “We’re still trying to get back what we lost over the last decade for sure,” he said. 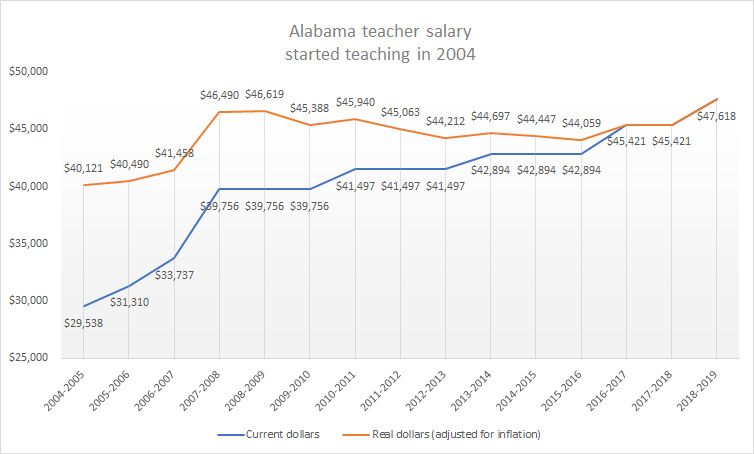 An AL.com analysis confirmed teacher pay is worth less now than it was a decade ago after adjusting for inflation. Losing that value has practical implications for teachers in Alabama’s classrooms. Imagine earning exactly what you did 10 years earlier, even though you’ve been working all of these years. Hayward said many teachers in Alabama qualify for reduced health insurance premiums because their pay is so low. “That’s a little bit humiliating to a professional person with a college degree,” Hayward said, and to have to ask for financial help with health insurance. Marlowe, whose parents were both teachers, said it isn’t uncommon for teachers to have two, three, or even four part-time jobs to supplement low teacher pay and to pay back student loans. Miller, whose wife is retiring from teaching this year, said he worked at Sears when his children were in day care. “How many other professionals have to get part-time jobs?” Miller asked. The public appears to support teachers’ fight for better pay. According to a recent NPR/Ipsos poll, only one in four Americans believe teachers are paid fairly. So what impact has inflation had? There are two ways to look at it: average pay or through examining an individual teacher’s salary progression. Many comparisons between states use average teacher pay, but because of the way teachers’ pay increases over time, averages can be skewed in one direction or the other based on the years of experience and the level of college degree a teacher holds. The longer a teacher teaches, the higher a teacher’s pay is. Advanced college degrees, generally speaking, also add dollars to a teacher’s paycheck, though the lawmakers placed more restrictions on advanced degrees and pay increases in 2017. 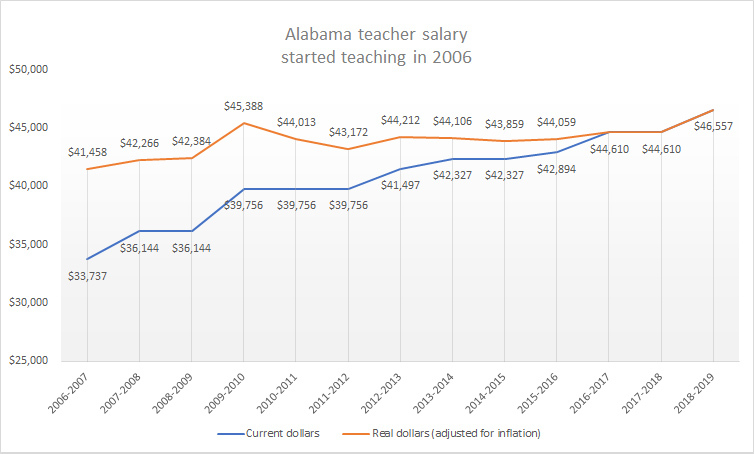 A quick look at how Alabama’s average annual teacher pay looks over time shows that when salaries are adjusted for inflation, the average teacher’s salary for the 2016-2017 school year is 7 percent lower than it was in during the 1999-2000 school year. Those same numbers show the value of a teacher’s salary dropped 9 percent from the 2009-2010 to 2016-2017 school year. In nationwide comparisons, Alabama’s average annual salary of $48,868 in the 2016-2017 school year ranks 37th in the country. South Dakota’s is the lowest, at $42,668, and New York’s is the highest at $79,637. But simply looking at the average pay doesn’t take into consideration the differences in cost of living among states. AL.com took the 2016-2017 average salaries from the National Center for Education Statistics and applied the 2017 annual average cost index developed by the Council for Community and Economic Research. It’s not perfect, and it doesn’t account for differences in areas within a state, but it’s a simple way to look at the numbers. So, adjusted for differences in the cost of living, how does Alabama’s 2017 average teacher salary compare? Alabama comes in at number 22, down from 19th in 2016, but up from 30th in 2014. 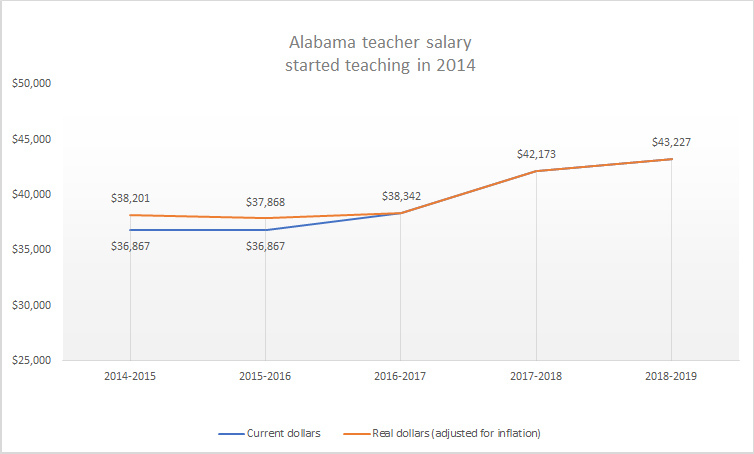 But because of the problems in using average pay data year over year, AL.com decided to look at a progression of a teacher’s gross salary (before deductions, but without benefits) over time and measure the effect of inflation on that salary. Most of Alabama’s 137 school districts use the state’s minimum salary schedule to pay teachers. That salary schedule requires hike in pay every three years, known as a “step” increase. In Alabama, the starting salary for a brand new teacher with a four-year Bachelor’s degree for the current school year is $38,342. It goes up to $39,301 next year. Using the state’s minimum salary schedule for each year, a teacher with a bachelor’s degree who began teaching in Alabama’s public K-12 schools in the 2004-2005 school year would have earned $29,358 as a starting salary. This year would mark the teacher’s 14th year teaching. Assuming the teacher did not earn any advanced degrees since the start of her career, that same teacher will earn $45,421 during the current school year. The value of that teacher’s year-over-year salary went up and down a few times, bottoming out in the 2015-2016 school year at $44,059—nearly $2,600 less than it had been in 2008-2009. Stagnant wages were a problem for many Americans during the Great Recession, certainly, but Alabama’s teachers have shown great patience, albeit perhaps unknowingly. Teachers new to Alabama’s classrooms have fared somewhat better. If a teacher first started teaching in the 2014-2015 school year, by next year, when the 2.5 percent raise kicks in, their salary will have increased from $36,867 to $43,227, equating to a 13 percent increase after adjusting for inflation. The average teacher in Alabama is in her 12th year of teaching. The chart below shows the salary progression of an Alabama teacher in her 12th year of teaching. The step hike upon gaining three years of experience was a big boost, but it eroded quickly over the next couple of years and still hasn’t recovered. There are, of course, other ways to analyze teachers’ salaries. One of the questions asked when comparisons are being made is how a teacher’s salary compares to other professions where a four-year college degree is required. Another analysis, in Governing magazine, showed teachers in Alabama earning 78 percent of what workers in the private sector earn. Their method used median salary estimates from the Census Bureau’s 2016 American Community Survey for employees who worked at least 35 hours a week, attended a minimum of four years of college and were age 25 or older. Their study calculated teacher pay nationwide equals 75 percent of what private sector workers earn. Some will likely say that teachers have an advantage because they “get summers off.” Try saying that to a teacher, who will tell you that couldn’t be farther from the truth. “Most districts are down to seven or eight weeks [of summer],” Miller said, and many of those days and weeks are spent in training and preparing for the new school year. “It’s also absurd to think that teachers arrive at 8:00 and leave at 3:00,” he said. Posted in Accountability, Advocacy, Education Budget, Funding For Education. Bookmark the permalink.